Spain’s brand-spankin’-new, noteably handsome prime minister Pedro Sánchez—a member of the Socialist Workers’ party who took office after former totalitarian PM Mariano Rajoy was booted following corruption convictions just last week—has made history. On Wednesday, Sánchez announced his new cabinet roles, the majority of which are filled by women (11 of 17 slots). 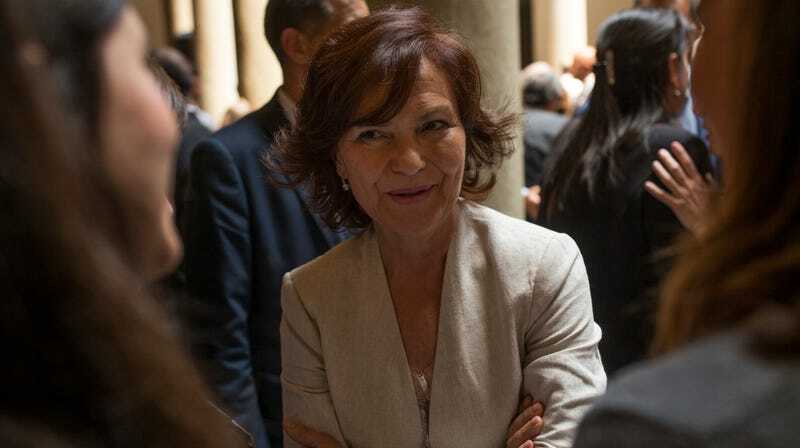 They include some of the country’s most prominent positions: Carmen Calvo is the new Deputy Prime Minister (seen above, she worked as culture minister for José Luis Rodríguez Zapatero’s Socialist government in 2004-2007), Maria Jesús Montero heads the finance ministry, Teresa Ribera leads the environment initiative (she was the director of the Spanish Office for Climate Change from 2004-2011), Margarita Robles is the new minister for defense, and Nadia Calviño is the new Spanish minister for economic affairs. Sánchez has also appointed two Catalans in the government—foreign minister Josep Borrell and Meritxell Batet will run public administration and, as Time reports, “will be responsible for building relationships across several regions with strong separatist movements, including Catalonia, which has finally got a new government after eight months of rule from Madrid.” It looks like Sánchez is attempting to repair a broken relationship between Spain and Catalonia, but Catalonian independence has yet to be discussed.